This play opens with a series of horrifying images on the screen: mutilation, torture, enslavement, murder, and inhumanity on a large scale. Where can they go from here I wondered. Well, very far indeed, and with a kind of intense simplicity that highlights the profound statement about what it is to experience and survive, or attempt to survive the racism and bigotry that lies at the heart of all societies during every period of history. 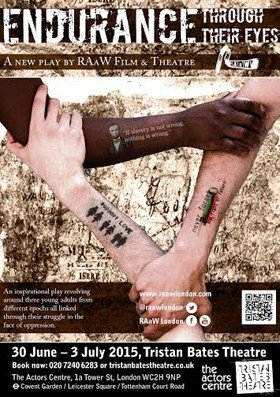 The play concerns three journeys: a black slave inuring the Civil War, a gay man after the Second World War, and a Palestinian in East Jerusalem now. The stories cut into each other, overlapped, and flowed back and forth seamlessly, creating one huge , agonising image of man’s inhumanity to man. ‘Nobody chooses to be a martyr’ say the Palestinian to his cousin as they are arrested while playing and innocent game of football. But martyrdom is forced on the three protagonists, as they are arrested, tortured and vilified for simply being who they are. ‘What’s wrong with you’ James’ father asks him, and the question is a sharp reminder of a the recent past when to be gay was ‘wrong’ and could lead to a twenty year prison sentence. The awkward discomfort of Louis Krommenhoek as the young homosexual was very moving, particularly in the scene with his friend and betrayer. In a very brief space both men’s dilemmas arising from fear and guilt drew us into the pain of simply being one’s self in an era that refused to acknowledge it. Adam, the Palestinian, is our contemporary, and read about his sufferings daily, and about the injustice and cruelty that surrounds him. There were violent moments in this story that were difficult to watch but one could no more look away than one can look away from the photographs, news stories and death lists that confront us every day. Indeed, as I was writing this, I received a news story about a prominent BBC journalist interviewing two Israeli politicians who called Israel the ‘Underdog’ without contradiction. ‘Endurance is unusual also in that it shows us the oppressors not merely as oppressors but a troubled people taking out their own fears on others: sexual jealousy, guilt, and mindless military brutality of the ‘I was only obeying orders’ kind that is sickeningly familiar. This play makes us realise how far we have come and what strides have been made since the Civil War, and yet it never lets us forget that the story has no end. The final scene said it all, quietly and powerfully: the cast gathered before us, singing ’Freedom’ while in the shadows behind them, the White shadows of the Ku Klux Klan stood silently, waiting. OK it was perhaps little simplistic, but with a play lasting only an hour, so what. It moved many of the audience to tears and the images were unforgettable. This play does, briefly and skilfully, show us what it is to endure oppression and also dramatise the need to fight against it at all times, because it is not going to go away. This company is a true multi-genre ensemble, dedicated to ‘championing new talent’ and ‘producing current and vibrant film and theatre.’ Bravo to everyone involved.